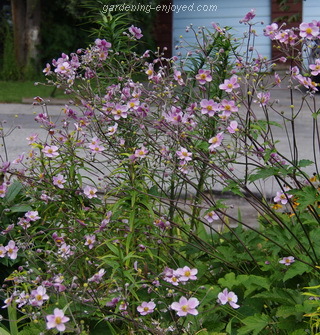 Dallying In The Dirt, Issue #187 --- Windflowers are waving in the wind. Procrastination is sometimes its own reward. I haven’t quite got around to making my big batches of Spaghetti Sauce or the batter for my Eggplant Fritters. Early this week I went to the basement to find something in the freezer for dinner and was dismayed to discover that it was already thawed. Everything in the very dead freezer was thawed. The mess is cleaned up, as is the entire cold room, not a job I had planned on but why go halfway; the new freezer is on its way and I can start cooking next week. Now for the planned activities, very few of which seem to have been accomplished. In the last few weeks I have observed a strange thing. I get batches of plants to trial each spring and we try to keep track of the good ones and the bad ones and let you know which are which. I had two varieties of Calibrachoa this spring. The deep red one has been around for a few years and the two tone pink was a hot new introduction. 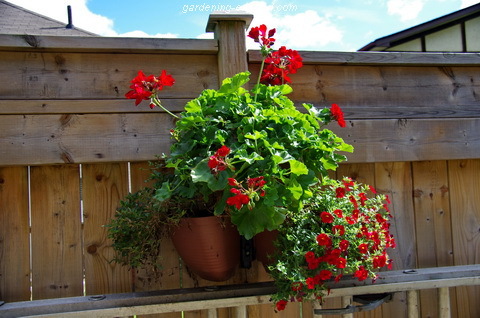 I planted four sets of the containers in the picture with red on one side and pink on the other. In each set the red is still glorious and the fancy new pink has given up for the season. The pink was also on the front steps underneath the Geraniums and they have quit for the year in that location as well. Avoid the fancy two toned pink next year. Anemone hupehensis is a perennial that I love to hate. The Japanese Anemone or Windflower is a delight at this time of year. Drifts of soft pink blooms wave back and forth on stems at least 1.3M tall (4.2 ft) supplying much needed fresh colour in the autumn garden. There is also a pure white variety that blooms a little later. They will even tolerate a bit of shade. Sounds like a delightful plant and in September it is. Next spring when it starts to emerge from the soil it will be occupying an area at least twice the size of this years. Rapidly growing underground rhizomes make this perennial a bit of a garden thug. I rip out great hunks of it each spring, knowing that by the fall there will be a nice sized clump waiting to wave its gorgeous blooms in the autumn winds. Some things are just worth a little extra work. Now I have to figure out how to over winter them. The Rex Begonias that were planted in the deep shade, to replace the Impatiens that had grown there for several years, have thrived and look wonderful. I’m too frugal to contemplate buying that many of them next year and I know that they make great houseplants. I don’t need 20 of them taking up space in my solarium all winter. They don’t make tubers so I can’t dig them up and save them. 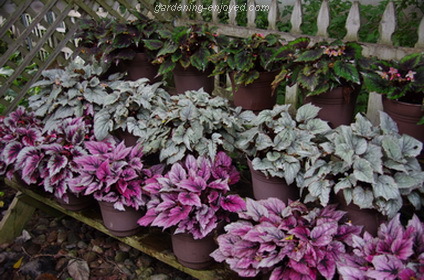 Most fancy leafed Begonias can be propagated with leaf cuttings. That’s the route that I think I’ll take. A few of them will move indoors and some time during the winter I will try the leaf cuttings in order to have enough to replant the containers next spring. I might ignore the ones with the dark green leaves as they really don’t show up that well in the deep shade. If you look closely at the picture you will notice that the first two on the bottom row are a different pink than the others. I will try to keep some of each plus the silver one and see how successful I am at propagating them this winter. It’s actually fun to try such experiments in the middle of winter when the gardener’ soul is getting desperate for the feel of soil under his fingers. Chris Asks? Thanks for all your wonderful articles!!! I saw you at the Beeton Horticultural meeting a while ago and you were terrific!!! Here is my question, 75 % of my Garlic I lost this year, apparently caused from nematodes in my soil. The root and bottom part of the Garlic bulb were all yellow and mushy. Can you tell me how to naturally rid these pests from my soil?